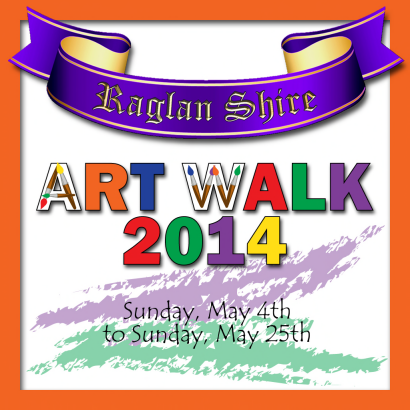 Sunday May 4th marked the start of the ninth annual Raglan Shire Artwalk. Running through to May 25th, the Artwalk brings together over 140 artists from across Second Life in a display of 2D and 3D art ranged across four regions of Raglan Shire, providing visitors not only with the opportunity to see photographs, artwork, and sculptures, but to also explore the Shire itself. 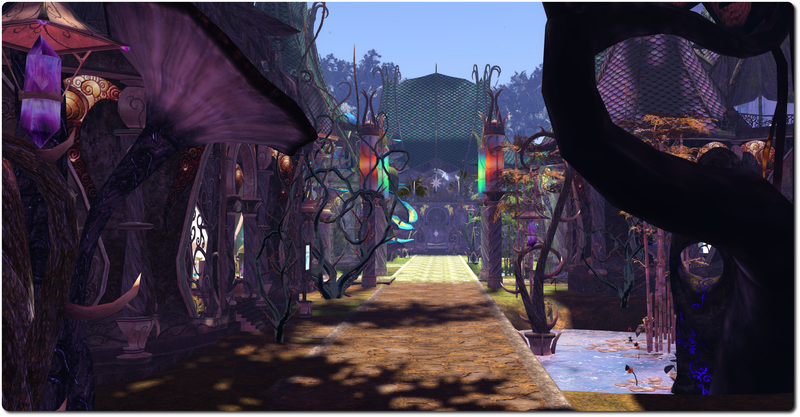 2D art of many kinds are exhibited along the hedgerows in the central area of Raglan Shire sim. 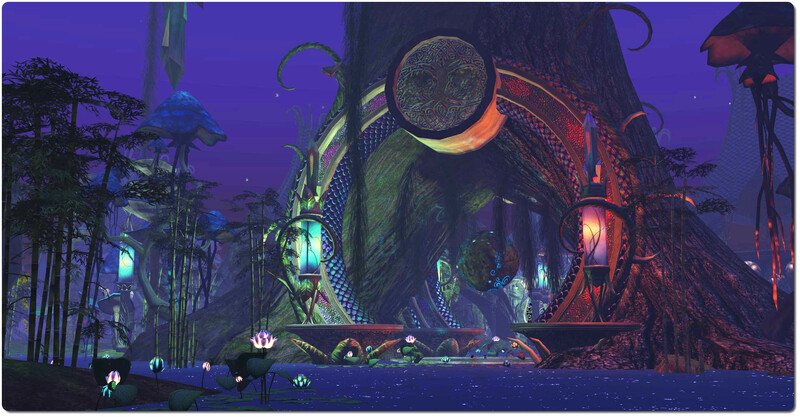 SL sculpture works are exhibited among the trees and along the shores of the western half of Heron Forest in Heron Shire, in the park on Morning Shire and around the Athen Shire village. TP kiosks to the display locations are throughout the grounds of the festival. 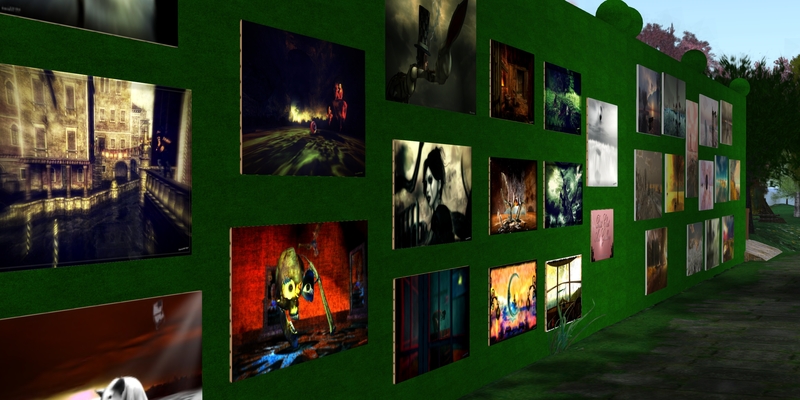 The Raglan Shire Artwalk is an excellent way to see art from a broad cross-section of SL painters, sculptors, photographers and artists, some of whom otherwise rarely exhibit their work, while others may well be very well-known. 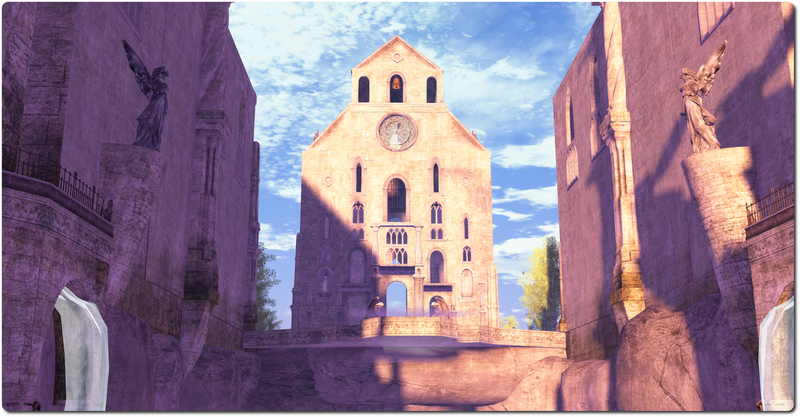 At the same time, the Walk brings with it the opportunity to discover more about the Tiny community of Raglan Shire. From any of the starting points, one is free to wander the footpaths and glades of the Shire, admiring the art and perhaps meeting some of the local residents. For those not that fond of walking, but who nevertheless prefer not to teleport everywhere, there is also a tour guide system available as well. Simply click on one of the green spheres at an arrival point, and let the caterpillar take you on a ride around the exhibits! Note that all regions are rated General. Two of my favourite Fantasy Faire designers are Elicio Ember and Alia Baroque. Their work never ceases to inspire and amaze me, and this year is no exception. – Extract from The Apprentice’s Journal, by Elicio Ember. Elicio takes as his theme the Faery Courts, both Seelie and Unseelie, presenting them together under the huge spreading boughs of the great Tree of Light and Dark. 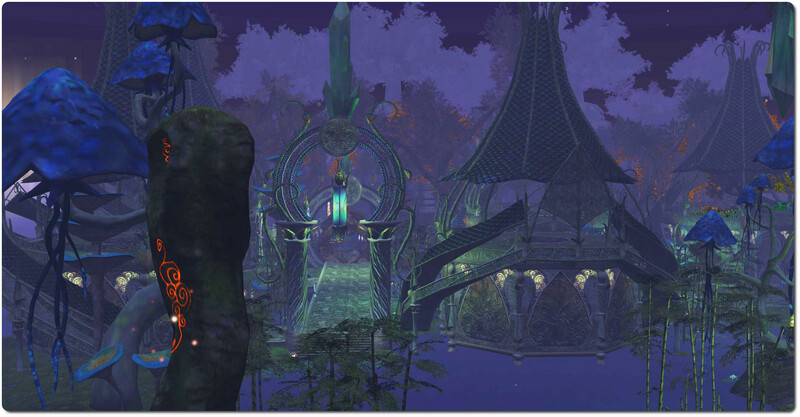 Here the high roofs of the pavilions and houses reflect the two courts, green for the Seelie, and darker lavender for the Unseelie, the two merging in the rooftop of the great pavilion of Cerridwen’s Cauldron as it faces the Tree of Light and Dark sitting at the centre of this realm. This is a region filled with a sense of other-worldliness, a place lifted out of the pages of myth and legend into which life has been breathed. It is also one of the more “open” environments in this year’s Faire, where some many of the regions feature woodland and undergrowth. Here there are broad avenues of stone, flowing water and broad pools upon which lilies float and grow. It’s a place with an air of mysticism and a suggestion of ancient fae rights, where great mushroom grow, and runes glow vein-like in the depths of carved rock. By day the light of the sun warms the stone avenues and sparkles on the warm waters; by night the Court is lit by dozens of softly glowing lanterns hanging from the boughs of the great Tree and along the sides of paths, forming constellations of colour beneath the light of the stars themselves. Laughter and song go hand-in-hand together here, and visitors from far and wide are welcomed. Even the plants here reflect the nature of the two courts, the great mushrooms amidst the tall growths of bamboo bearing the light colours of spring and summer, while those gathered around the houses of the Unseelie carry the darker colours of winter, and the bamboo growth and grass bear the browns of autumn. Travel to the Faery Court. Alia Baroque takes as his theme a great cathedral abbey, floating on green isle above the world, yet anchored to it by great chains; a point lifted towards heaven, yet still beneath it, visible from all the lands around, and where a great stair of glass rises upwards to the gates of paradise. Most people fly or teleport to Sanctum, but if you tread carefully from either Blackwater Glenn or the Fairelands Junction, you’ll find you can ascend gently to the Sanctum by way of glass stair and floating isles – just keep between the chains! One of the reasons I’m attracted to Sanctum is my love of ancient sites, and there are a number of favourites here in the UK, such as Fountains Abbey in Yorkshire and other great abbeys and cathedrals. While Sanctum is wholly unique and unlike anything I’ve visited in the real world (not least because of it position floating in the sky! ), parts of it nevertheless stir memories of visits to place like Fountains, and to churches and cathedrals in Europe. 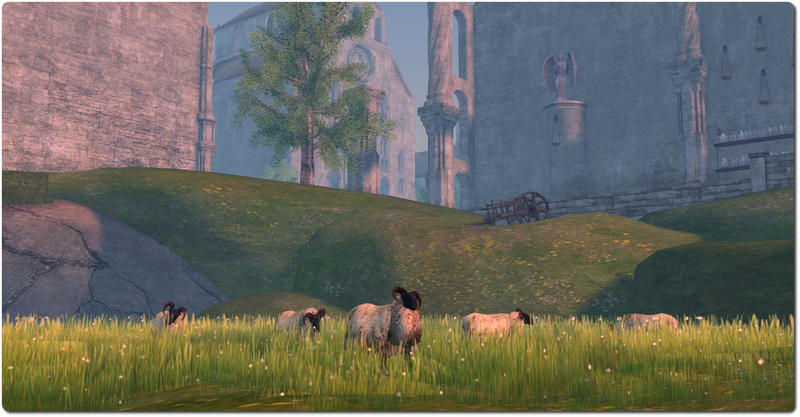 This is a place of peace and contemplation, where sheep gaze on the grass-topped rocks on which Sanctum is founded, and where stone angels raise their trumpets to the heavens and faint figures stand within high alcoves, shimmering in the half-light as water tumbles from the rock isles to the world below. 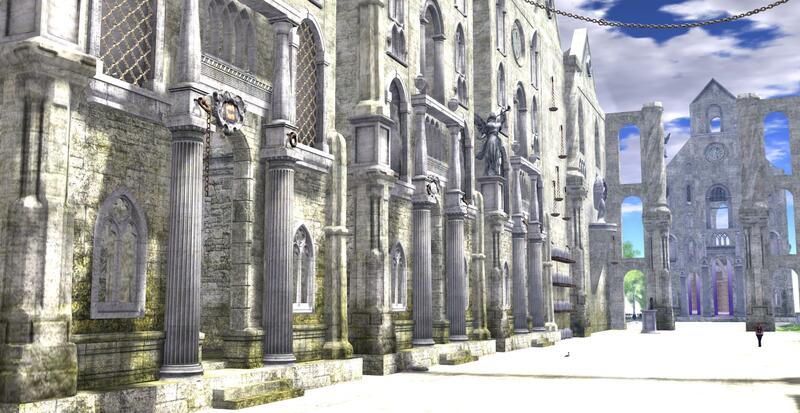 Others eyes also watch over all who visit here; not all of the statues which may be found here might be quite what the seem, as bloggers for the Faire have the chance to become a part of the Sanctum and simply stand and watch those who come and go. The detail in this build is magnificent, and kept me engaged for a fair amount of time during the blogger’s preview, such was the care and attention evidenced. Even now, when time (which isn’t entirely on my side as I’d hoped this week) allows me in-world and I can get over the Faire, the Sanctum is one of the places to which I’m inevitably drawn. On Tuesday May 6th, the Lab announced the “Project Interesting” viewer has finally made it to a release status with the arrival of version 3.7.7.289461 of the viewer as the de facto release version. Available since mid-November 2013 as a release candidate viewer, this release represents the last stage in the current work on improving interest list functionality, the code which controls how the data relating to your in-world view is handled by both the server and the viewer. 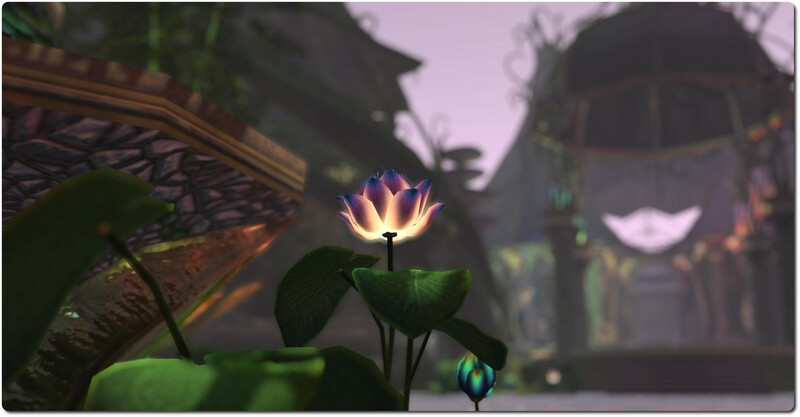 This includes what is sent to the viewer, what is retained by the viewer for reuse and things like the order in which objects are rendered when you log-in to SL or teleport (so that the “interesting” objects which are closer to you or which are particularly large should render first, for example). To mark the viewer’s formal release, the Lab has re-issued a video by Torley Linden, originally released when the viewer first made it to release candidate status, which neatly encapsulates the key updates contained within the viewer, and how they relate to server-side changes which have already been implemented. There are no scheduled simulator deployments this week to either the Main or RC channels, and so no associated rolling restarted expected. 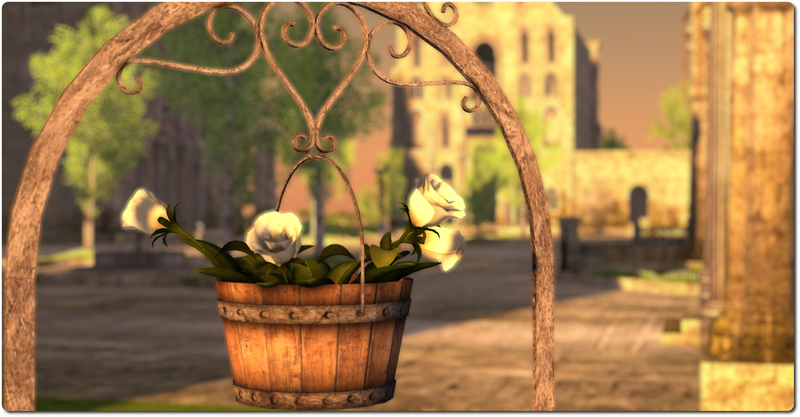 The Interest List RC finally made it to the de facto release viewer with its promotion on Tuesday May 5th (version 3.7.7.289461). This leaves just three RC viewer in the release channel at present: SL Share 2 project viewer version 3.7.7.289497; Sunshine / AIS v3 RC version 3.7.7.289441; and the Maintenance RC viewer version 3.7.7.289405. Please refer to my Current Viewer Release page for up-to-date information on all viewer releases. Simon Linden’s optimisation work for group chat was deployed across all of the back-end chat servers on Monday May 5th. while these should see some improvements in group chat (particularly in sending / receiving chat and moving between regions), Simon does warn that these optimisations are not expected to “fix” all of group chat. However, he will continue to work on further improvements as well. 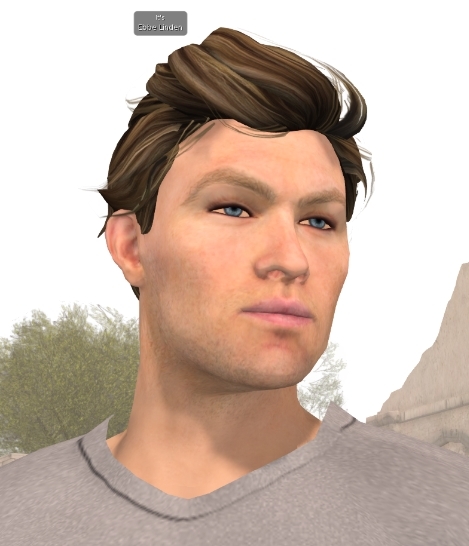 During his appearance at the VWBPE conference in mid-April, Ebbe Altberg appeared using one of the new starter avatars. At the time he did, it was hinted that the new avatars would be appearing relatively imminently. However, almost a month on and they have yet to officially appear, although there is some speculation they’ll do so in May. these new avatars are said to take advantage of some of the latest features in SL, which is being taken to mean that some / all are full or partial mesh. This has in turn raised questions as to whether it is wise giving new starters full mesh avatars, given they may not work with freebie items often offered to or picked-up by new starters. While there is no confirmation any work is being carried out on this (except, as Simon quipped, “perhaps in a parallel universe or something”), the Lab is still sounding out how and where such calls would likely be used, and the frequency with which such calls would be made. The option of having scripted control of materials has been debated often, and still remains a desired item among builders and scripters. However, some of the concerns still remain – notably, have such capabilities might end up causing performance issues, deliberately or otherwise. Much has already been written on how rapid map flipping on multiple objects could deliberately impact performance and potentially result in viewer crashes, plus there are already animated mesh elements available which can also have a significant impact on viewer performance (some types of animated mesh tail can reportedly overload a viewer on a 32-bit system with out-of-memory errors in a matter of seconds), so there are also concerns that were this to be combined with the ability to change textures via script, they could (even unintentionally) have further dramatic impacts on performance. One way around this would be to throttle the rate at which material maps can be changed via scripted command. What is interesting for the moment is that the Lab appears to have not completely closed the door on scripted control of materials, but is considering options and informally seeking feedback on potential use cases.